A Panzerkampfwagen 35(t) from Panzer Abteilung 65 leads a column of Panzerkampfwagen IVs during the Battle of France. 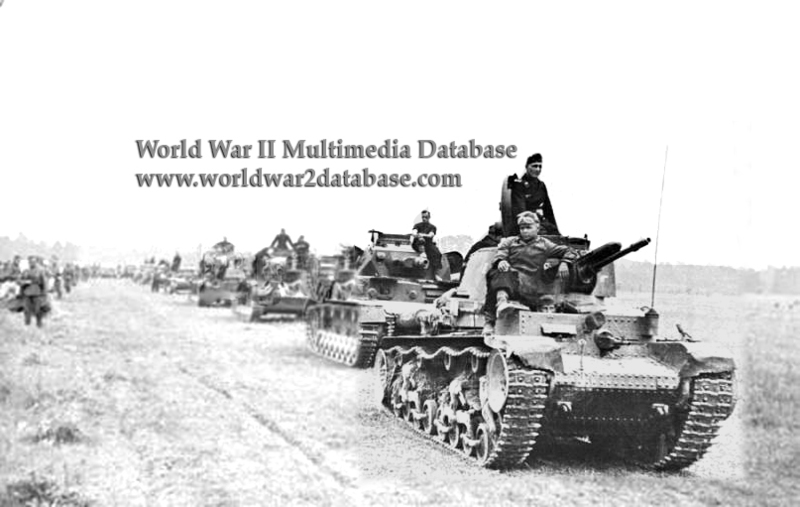 118 PzKpfw 35(t)s were issued to the 6th Panzer Division; used as a substitute for the better armed and armored Panzer III, the 35(t)'s main 37mm (1.45 inch) gun was not as capable and it did not have as much armor. The Czech-designed tank did have innovative pneumatic power steering, which relieved stress on the driver. The 6th Division had some trouble adapting the tank to German use, as the manuals were in Czech. Nevertheless, 6th Panzer crossed 217 miles of France in nine days, captured the British 145th Infantry Brigade at Cassel, and took part in the conquest of Flanders and the Aisne River, eventaully reaching the Swiss border. Almost all the 35(t)s would be lost during Operation Barbarossa, when their guns and armor were inferior to the Soviet KV and T-34 tanks, and the pneumatic steering failed in the cold.